But after every loss a team learns a lesson, and the Bobcats learned they can always count on goalie Nicole Lewis. Lewis recorded her fourth double-digit save of the season, stopping a career-high 20 shots. Lewis broke her career record which was set against Yale on Sept. 4, when she blocked 19 shots. 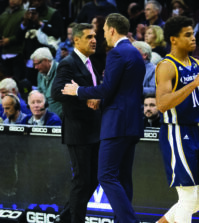 Quinnipiac head coach Becca Main Kohli had confidence in Lewis to lead the defense in a game against a nationally ranked team. “Nicole spearheaded it in the goal cage,” Main Kohli said. The Bobcats came into the game with a defense first mentality, leaving a lot of pressure on Lewis and her defenders. 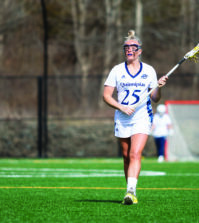 They rallied from a 2-1 deficit on Ashley Gradwell’s game-tying goal in the 68th minute, but Maine’s 23 shots on goal were too much to overcome. But it was Lewis and the defense that kept them in the game. Lewis has now recorded 91 saves on the year. Lewis made multiple diving plays, allowing three goals on 28 shot attempts. Even though most of the game was played on Quinnipiac’s defensive end, Lewis only allowed one goal on 16 corners taken by the Black Bears. “It wasn’t luck or being in the right spot, it was she scouted correctly and did a fantastic job in bringing it to her physical presence today,” Main Kohli said. The Bobcats will look to Lewis and the defense to continue their success when they travel to Lafayette on Sunday.